Mr. Obama held a “town hall” meeting with students on Monday. But they were carefully vetted and prepped for the event by the government, participants said. 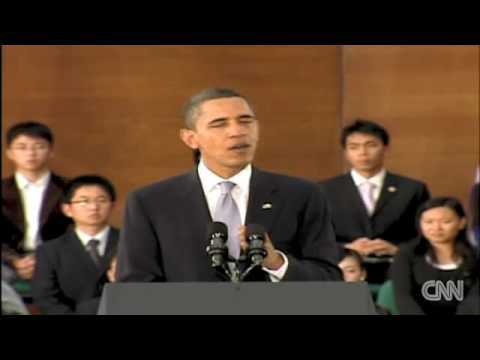 And the Chinese authorities, wielding a practiced mix of censorship and diplomatic pressure, succeeded in limiting Mr. Obama’s exposure to a point where a third of some 40 Beijing university students interviewed Tuesday were unaware that he had just met in Shanghai with their colleagues. 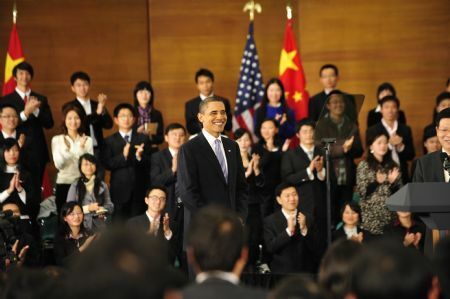 When President Obama took the stage in Shanghai on Monday for his faux town-hall with 400 carefully selected Communist Youth Leaguers (future Chinese leaders), he had already lost the crowd. Amid reports that the town-hall participants had been held in splendid isolation in the days prior to the town-hall and subjected to special "training" for their participation, the Chinese authorities managed to wring every ounce of spontaneity out of the event. Not that it mattered much, since most Chinese were unable to watch what the White House had billed as its big attempt to reach out directly to the Chinese people because their government had helpfully blocked it online and was only carrying it on local TV in Shanghai. Obama ended up getting about eight questions, and they were mostly softballs from students who didn't really challenge their own government on important issues such as human rights. But the president used the forum to push for China to open up the Internet for freedom of expression. There were also some light moments, such as when Obama was twice asked about winning the Nobel Peace Prize and joked: "Let me tell you that I don't know if there's a curriculum or course of study that leads you to win the Nobel Peace Prize."